Islamist Nusra Front forces have re-captured Syria’s oldest Christian community from government troops in a night of fighting. The small village of Maaloula, once a peaceful spiritual place, became a battlefield on Wednesday. The rebels captured the symbolically important village after forcing out government troops, who had previously pushed the insurgents to the mountainous outskirts of the village, reports AFP citing local sources. "The rebels are inside Maaloula, all of Maaloula. 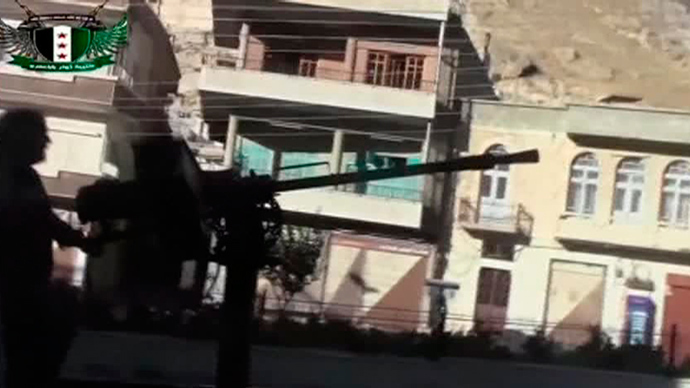 The government troops have pulled out of Maaloula," a resident told the agency by phone. The London-based pro-rebel Syrian Observatory for Human Rights group reported that the opposition received reinforcements, which helped them take control. 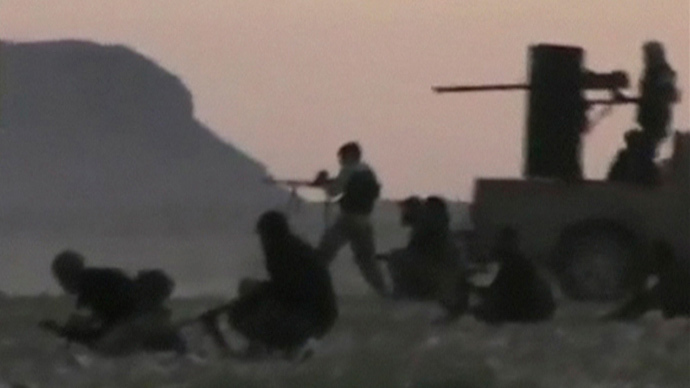 The battle left at least 17 rebels dead and more than 100 wounded, the Observatory said. There were no immediate casualty reports from the government forces. Syrian government forces launched an attack to wrest back control of a historic Christian town north of Damascus late on Monday. Members of the Al-Qaeda-linked Nusra Front uploaded a video statement to YouTube on Sunday denying any intention to occupy Maaloula. "Soon we will withdraw from this city not out of fear but to leave its homes to their owners. They were not our target. Our target was mainly military," said a man in the video, whose face cannot be seen because of a balaclava. 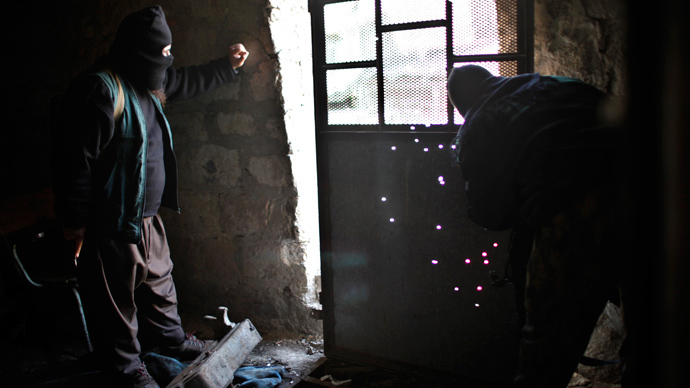 RT’s crew traveled to the site only to find themselves in a crossfire between government forces and rebels. “It’s hard to believe that what used to be one of the most significant shrines of the Christian community all over the world is a battlefield now,” Maria Finoshina reported from outside the village. “We’ve entered Maaloula village with the army, but just a few minutes later we were told to get back,” she says, as intensive shooting could be heard in the background. The Al-Qaeda-linked Nusra Front and its allies first attacked Maaloula, which is located just north of Damascus, on Wednesday. 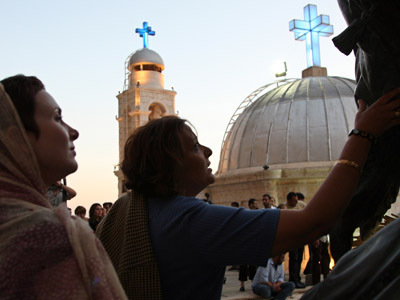 The village is considered a symbol of Christianity in Syria, with many inhabitants there speaking Aramaic, an ancient language spoken by Jesus Christ. There were reports of Islamist attacks on Christian churches after the initial advance. Government forces managed to re-take the village on Friday. But the difficult mountainous landscape of the area negated the army’s weapons advantage, offering rebels plenty of vantage points and places to hide from airstrikes. Maaloula, which has some 2,000 residents, is on a UNESCO list of proposed world heritage sites. Before this week it had been mostly untouched by the two-year-long Syrian conflict, which has left an estimated 100,000 people dead and forced more than two million to become refugees.